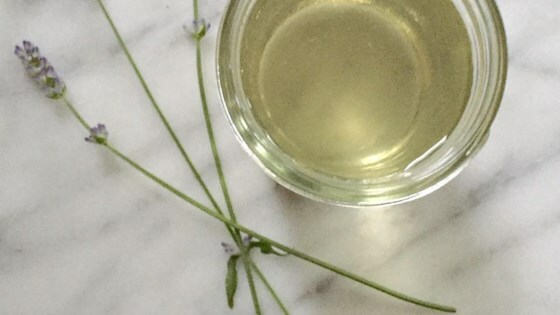 "Fresh lavender blossoms are steeped with sugar and water to create a sweet and aromatic floral syrup to flavor cocktails, lemonade, cakes, and sorbets." Combine water, sugar, and lavender blossoms in a small saucepan. Bring to a boil, stirring until sugar dissolves. Simmer for 1 minute. Remove from heat and let syrup steep, about 30 minutes. Pour syrup into a sterilized glass jar through a mesh strainer to remove blossoms; let cool. I found it to be extremely weak, I normally boil my simple syrup down to be somewhat on the thicker side, maybe not enough lavender buds, I don't know? I made this as is. It makes my cocktails taste fresh. Gin, little of this syrup ,juice of half lemon ice and top off with club soda. Yummy! Tastes like Spring! I will be using my Lavender Simple Syrup in fruit martinis It will compliment the fruit Martini's beautifully.